General description : See this 1950 Chevrolet Styleline Deluxe on display in our Dallas, Texas showroom.Now available in our Dallas Showroom is this 1950 Deluxe-Styleline. Although there was over 80,000 + of these made, the years have passed, and the numbers of these left has dwindled. They made two different types of deluxe back in 1950, the Fleetline and the Styleline. Fleetline were more of a fastback style, while Styleline’s were more of a bubbletop appearance. This Deluxe is powered by a traditional 216.5 CID, 6-Cyclinder engine which produces approximately 92 HP to the tires. The interior is fresh and really pops with the red and white coloring throughout. It has a 50/50 bench style seat up front, so you can pull your significant other close as you’re cruising down the road. This truck is going to be a lot of fun to a new owner very soon… will that be you? To view this vehicle in greater detail including 100+ HD pictures and videos, visit our website at http://www.GatewayClassicCars.com. 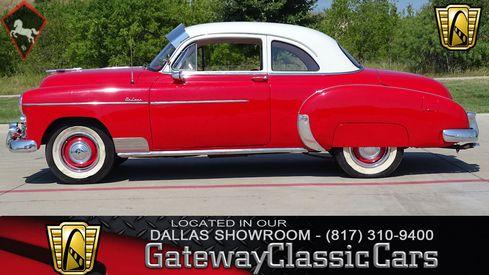 For additional information on this 1950 Deluxe-Styleline, email us at dallas@gatewayclassiccars.com or call 817-310-9400. 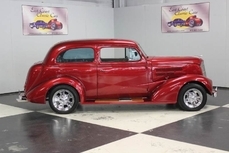 1950 Chevrolet Deluxe I-6 is listed for sale on ClassicDigest in DFW Airport by Gateway Classic Cars - Dallas for $13595.